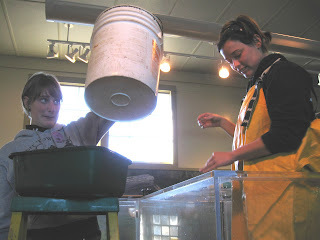 Last week we began releasing some of our animals for the winter. 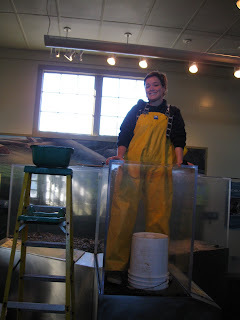 We released nearly all of the animals from the eel grass tank, the rocky cluster and the kelp cluster tanks. It was quite an adventure! The poor eel grass tank had been in disarray for nearly a week with the lack of available eel grass washing ashore. I was happy to release all of the fish back to the eel grass meadows off our lower dock. As I watched them swim to freedom I hoped their last catered and nearly spoon fed meal of brine shrimp and krill would provide adequate nutrition while adapting back to life in the ocean. The real fun however began once the animals had been cleared out of our cluster tanks. 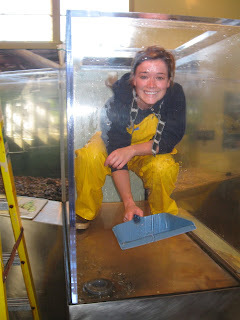 I put on a full rain gear suit, rubber boots and all, and climbed into the tanks to scrub away with fresh water. 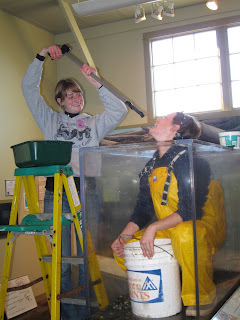 This task proved to be quite difficult as my body seemed to take up nearly half of the tank, but I managed well and worked quickly. It's amazing what you can clean with an old tooth brush and a dust pan! I will miss my cluster tank friends who have been released back into the ocean and now eagerly await for Spring when our tanks will be filled to the brim with new life. I'll be sure to keep you updated! Allison posing in the rocky cluster tank. All pictures taken by Chrissy McLean. Wow--it looks like SO much fun!! I always think the animals come asking to be picked again in the spring. It makes me believe they like living at the PTMSC for a season. Snow doesn't keep vounteers away!